Touching the butterfly project for the commissioning. The Annual KBI Dinner in Phoenix is coming up, and we hope you can join us. We’re also happy to welcome our new legal fellow; fill you in on the recent Walking in Mercy Youth Summit; invite you to stream the first-ever Virtual Teach-In on Migration: and share details about upcoming KBI staff activities and last month’s immersion trips. Annual Phoenix Dinner: The Eighth Annual Kino Border Initiative Dinner in Phoenix is only weeks away! Held in Phoenix on Saturday, March 9, 2019, this KBI event offers an opportunity to update our supporters on our aid, education, and advocacy efforts, and is a major source of funding for these programs. You can learn more about the KBI dinner and purchase tickets here: https://www.kinoborderinitiative.org/2019-kbi-annual-dinner/. Many thanks for your generous support of the KBI! New Legal Fellow: The KBI is pleased to announce Alex Miller as our new KBI/Florence Project legal fellow. A Tucson native, Alex received her undergraduate degree in International Relations and Affairs from Georgetown University and her law degree from Stanford University. Early on, she interned with the International Organization of Migration in Bangkok, Thailand, and was a fellow at the Center for Public Integrity in Maputo, Mozambique. In recent years, Alex worked at a New York law firm. She is excited that her new position brings her back to her borderlands home. The KBI and the Florence Project look forward to working with her to provide legal representation for asylum seekers and build cases that advance asylum law. ¡Bienvenida, Alex! Third Annual Walking in Mercy Youth Summit: In early February, Kino Teens from six southern Arizona high schools—around 80 in all—gathered in Tucson at Augustine Catholic High School for an afternoon of discussion and workshops about the migrant experience, the asylum process, and ways to organize advocacy efforts in their communities. 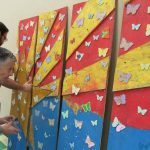 They shared stories and testimonies, and in an act of accompaniment with migrants and asylum seekers, wrote words and wishes on wooden butterflies fastened to a large wooden Arizona flag. 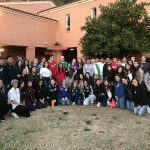 KBI staff Joanna Williams, Father Pete Neeley, S.J., and Katie Sharar were on hand to facilitate; Bishop Edward Weisenburger of Tucson celebrated the closing Mass. Participants left the summit with new ideas and action plans, taking a plank of the butterfly-adorned flag and a shared commitment to advocacy back to their schools. This year’s summit participants gather for a group portrait after a productive and inspiring afternoon. 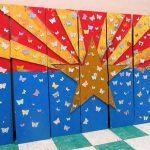 Summit participants decorate butterflies to fasten on the Arizona flag. The butterfly project in its entirety, and ready for distribution to six southern Arizona schools. Juan Carlos, a young man from Honduras who came through the KBI and won asylum in the U.S., shares his experience. Director of Education and Advocacy Joanna Williams supports with interpretation. This year’s summit participants gather for a group portrait after a productive and inspiring afternoon. Photo by Leslie Gjerstad. The KBI on the Road: Director of Education and Advocacy Joanna Williams will be doing presentations on February 12 and 13 at Seattle University as part of their Institute for Thought and Culture. She will also give a briefing about the recently released report, Communities in Crisis: Interior Removals and Their Human Consequences (available at: https://www.kinoborderinitiative.org/advocacy/), in Washington, D.C. in late February. KBI staff will also attend important gatherings on both sides of the border—Father Samuel Lozano, S.J., Director of Programs–Mexico, at a Human Mobility Convening of the Catholic Church in Mexico, February 14–17; and Executive Director, Father Sean Carroll, S.J., at a meeting of Texas and Mexico bishops in El Paso, February 25–27. 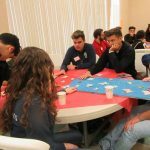 Virtual Teach-In on Migration: On Saturday, March 2, 2019, the Ignatian Solidarity Network is hosting its first annual Virtual Ignatian Family Teach-In for Justice. The opening event of this year’s Ignatian Family Advocacy Month, this three-hour videostreamed conference will focus on migration issues, at the border and throughout the U.S., and offers engaging presentations—including a keynote by the KBI’s Father Pete Neeley, S.J.—virtual networking, and shared reflections. For more information, go to: https://ignatiansolidarity.net/virtual-teach-in/. Register here: https://ignatiansolidarity.wufoo.com/forms/virtual-iftj-registration/?utm_source=ISN+Updates+List&utm_campaign=00f5d4d53a-IFTJ_2013_Follow_Up11_26_2013_COPY_01&utm_medium=email&utm_term=0_f721035495-00f5d4d53a-255963729&mc_cid=00f5d4d53a&mc_eid=83cf92898d. 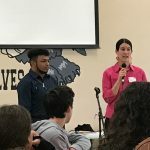 Immersion Experiences: In January, the KBI hosted immersions for university faculty and students from across the country and for three southern Arizona high school groups.